Mumbai: Equity fundraising by listed Indian companies crossed the ₹ 1 trillion mark during fiscal 2016—the highest in five years and the fourth highest overall. Companies have picked up ₹ 1.04 trillion through equity issuances so far this fiscal year, the highest since 2011, showed data from Prime Database, a primary market tracker operated by Praxis Consulting and Information Services Pvt. Ltd.
A significant portion—close to 86%—of the total raised this year has been by way of secondary market offerings, private placements and preferential allotments, amid a downtrend in the secondary markets. The benchmark Sensex has lost close to 9.5% this fiscal year, according to Bloomberg data. Investment bankers view the equity fundraising activity as a positive sign for Indian markets overall and expect the trend to play out in similar fashion to the one observed between fiscals 2004 and 2008 when Indian companies raised a total of more than ₹ 3.5 trillion. “This year’s activity has been fairly diversified with some very large government deals, a fair amount of IPOs (initial public offerings) and large transactions," said V. Jayasankar, senior executive director and head of equity capital markets at Kotak Mahindra Capital Co. Ltd.
Jayasankar said the markets will continue to see a pickup in fresh issuances, such as IPOs and institutional placements, if there is a similar pickup in macroeconomic growth and need for capital expenditure. Money raised through IPOs during fiscal 2016 stood at ₹ 14,461.32 crore, according to data by Prime Database. Close to 25 firms tapped the IPO market during the fiscal year. Marquee issues include those by InterGlobe Aviation Ltd, the owner of India’s largest and most profitable airline IndiGo, which raised ₹ 3,130 crore—the biggest IPO since Bharti Infratel Ltd’s ₹ 4,100 crore offering in December 2012. Coffee Day Enterprises Ltd, the owner and operator of coffee chain Café Coffee Day, raised ₹ 1,150 crore in October. Tata Motors Ltd raised ₹ 7,500 crore in the third-largest rights offering by value. In all, 10 companies conducted rights issues—sale of shares to existing shareholders—to raise a total of ₹ 9,034 crore this fiscal year. Money raised through institutional placements totalled ₹ 14,357.87 crore, whereas that from offer for sale (OFS) stood at ₹ 19,819.71 crore. Twenty firms raised money through qualified institutional placements (QIPs) in the fiscal year. As far as government deals are concerned, the centre raised ₹ 18,352 crore this fiscal year by selling minority stakes in seven firms, including Indian Oil Corp. Ltd. The government sold a 10% stake in the oil marketing company for ₹ 9,369 crore—the sixth largest government deal ever. Preferential allotments were valued at ₹ 46,508.65 crore, largely driven by fund infusion in public sector banks by the government and government-backed institutions as part of bank recapitalization drive. India’s largest bank by asset value, State Bank of India, saw an infusion of ₹ 8,363 crore by the government. Other banks where the government infused capital include Bank of India ( ₹ 2,455 crore), IDBI Bank Ltd ( ₹ 2,229 crore), Indian Overseas Bank ( ₹ 2,009 crore), Bank of Baroda ( ₹ 1,786 crore) and Punjab National Bank ( ₹ 1,732 crore). In all, 27 public sector banks saw capital infusion this fiscal year to the tune of ₹ 30,911.89 crore, data showed. Prithvi Haldea, founder-chairman of Prime Database, said that preferential allotments are typically done to the promoter or promoter group and are for raising stake or for meeting a company’s funding requirements. “Preferential allotments do not involve public markets. What we need is more activity in the public markets, especially IPOs. Secondary market transactions do not create capital formation," said Haldea, adding that there was a huge demand-supply mismatch, and there needs to be a pickup in IPOs and QIPs. Haldea pointed out that the recent IPO activity was more to provide exits to private equity and venture capital funds. “IPO market has been lacklustre with very small-sized IPOs tapping the market," he added. Last fiscal, Indian firms raised ₹ 95,161.06 crore, data showed. The fund mobilization peaked in fiscal 2008 at ₹ 1.66 trillion. This was followed by ₹ 1.33 trillion in FY10 and ₹ 1.14 trillion in FY11. While the secondary market issues have dominated the markets, things remain positive for Indian markets, said an investment banker with a US bank, on condition of anonymity owing to compliance rules. 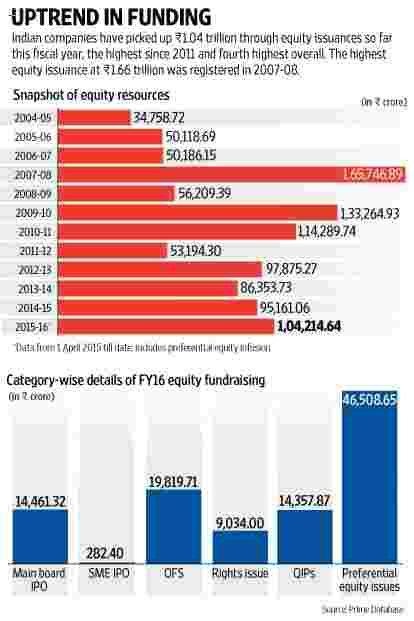 “The year has been the best after 2010-11 and gives a lot of hope that the fundraising trend will continue. Secondary market issuances are a sign of capital markets maturing and show that investors are more willing to buy on the secondary market, which is good because it’s leading to a capital churn in the markets," the banker said. “We believe the fundraising activity will continue. Things may have slowed down a bit of late, but they have not collapsed. We’re hoping it will be like 2004-2008, when fundraising consistently picked up. We do not want it to be like 2010-2011 when activity spiked and suddenly fell flat," the banker added.